In this article we will discuss feasibility study in project management. Why is it Important for Project Management ? How to conduct a Feasibility Study for a Project ? Feasibility study is conducted to determine the practicality of an idea or a proposed plan. For example an organization may conduct this study to ensure if a project is operationally and technically feasible as well as economically applicable. The result of this study summarizes advantages and disadvantages to support decision making and demonstrate if the project is doable or not. There are many factors affect a projects successful completion. Some projects require many different types of resources that may cost too much to the organization considering the payback period of the project. A properly created feasibility study provides inputs for decision making as well as historical background of the business or project. For example board of directors of a corporate need the details of the product, marketing research, financial data, legal requirements, and tax obligations to decide if a project is feasible or not. A feasibility study evaluates a project’s chance of success. Therefore potential investors first check if the study is created from an objective perspective. Here below you can find five types of feasibiliy study. Legal feasibility is an analysis performed to understand if the proposed plan conform the legal and ethical requirements. These requirements may involve zoning laws, data protection acts, or social media laws etc. For example your company is planning to open a branch in a new region. According to the studies you recognize that the country does not allow an individual foreigner owning a property. Therefore you select the rental option instead of buying. Economic feasibility study involves a cost benefits analysis to identify how well, or how poorly, a project will be concluded. You calculate the monetary value of each cost and benefit seperately do decide if the project is economically feasible or not. For example your company is planning to perform a housing project on the west coast of the city. In order to understand if the project is economically feasible, you will calculate the duration, cost and the income of the project. If the calculations demonstrate a short pay back period, the board of directors will decide to undertake the project. Technical feasibility is a broad concept which can be applied to a software development project, pipeline construction project or a military project. Each project require different technical specifications and standards. Technical feasibility is the process of validating the technical resources and capabilities to convert the ideas into working systems. For example your company is planning to improve the current network infrastructure. You analyzed the new system and concluded that the new system can use the organization’s existing network infrastructure. This shows that new system is technically feasible. Operational feasibility is performed to understand well a proposed system solves the problems. From this aspect, operational feasibility studies are critical for system engineering and affect early design phases. For example your company has undertaken a project to build a new themepark for a client. Then you performed a study to determine how the themepark will operate in a way that is conducive to its inhabitants, parking, dining, human flow, accessibility. This can be an example for operational feasibility. Completing a project on time is very important from an investors perspective. Scheduling feasibility is a measure of how reasonable the project duration is. If the project takes longer than estimated, investors will have to bear extra costs. For example an investor proposed a hotel construction project to your company. However he requested that the project will be completed in one year. The project team conducted a feasibility study based on a list of requirements to complete the project on time. After analyzing the legal, technical, economic, scheduling and operational feasibility studies, you will identify any constraints the proposed project may face. Simply put, a project may face with internal and external constraints. Technical, technology and budget are example for internal project constraints. Financial, marketing are example for internal corporate constraints. Laws, regulations and environments are example for external constraints. 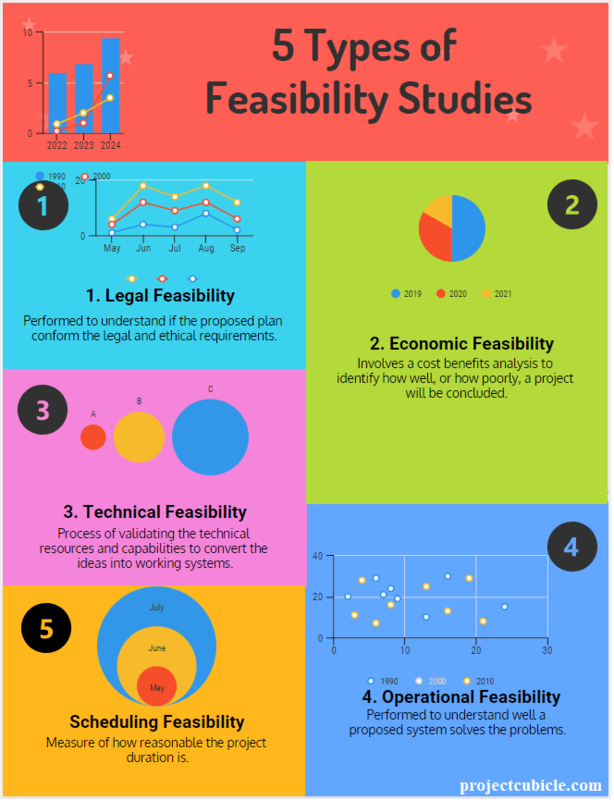 What are the Benefits of Conducting a Feasibility Study ? Organizations need feasibility studies before to start a project or decide to make an investment. Because such decisions require allocating resources and spending money. A feasibility study might change or modify the project’s scope based on the inputs. Therefore conducting a study always helps to prevent the company from risks and uncertainties. Many organizations mistakenly skip the “feasibility analysis” step and go directly to perform the project. This leads the failure of the project in most cases. Note that once decisions have been made to proceed without having a proper feasibility study, it is difficult to avoid potantial losses. Therefore it is a good business practice to conduct a feasibility study for any type of project which involves risks and uncertainties. Next articleBusiness Plan , How to Create a Business Plan ? Business Plan , How to Create a Business Plan ?